Double Dragon is a bad yet still cheesy movie that screams 1990s with its style and direction, not to mention some over-the-top performances. I didn’t exactly hate this movie but it was hard to sit through at times. Embrace of the Vampire (1995) is simply a bad movie made only for a child star in Alyssa Milano trying to strip (figuratively and literally) that persona. The story is lacking, and the performances are bland and the movie as a whole is downright boring leading to something with nothing to offer (even Ms. Milano’s breasts aren’t worth the sludge you have to wade through). 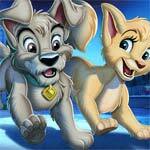 Lady and the Tramp II: Scamp’s Adventure is another unnecessary direct-to-video from Disney. It tries to harp back to the nostalgia of the original but it falls flat at each stretch of the lame story. The Blu-ray at least has solid video/audio transfers and the features, while nothing great, are half-decent.